Nelson Mandela (1918-2013) was a South African anti-apartheid revolutionary and political leader who served as President of South Africa from 1994 to 1999. He was the country's first black head of state and the first elected in a fully representative democratic election. He was born a Xhosa, studied law and started working as a lawyer in Johannesburg. There he became involved in anti-colonial and African nationalist politics, joining the ANC in 1943. In 1962, he was arrested for conspiring to overthrow the state and sentenced to life imprisonment. Mandela served 27 years in prison, initially on Robben Island. Amid growing domestic and international pressure, and with fears of a racial civil war, President F. W. de Klerk released him in 1990. In 1993 he received the Nobel Peace Prize and is held in deep respect within South Africa, where he is often referred to by his Xhosa clan name, "Madiba", and described as the "Father of the Nation". Mandela quoted from King's "I Have a Dream" speech — "Free at last, free at last, thank God Almighty we are free at last" — during his 1994 address to the U.S. Congress. King and Mandela never met. 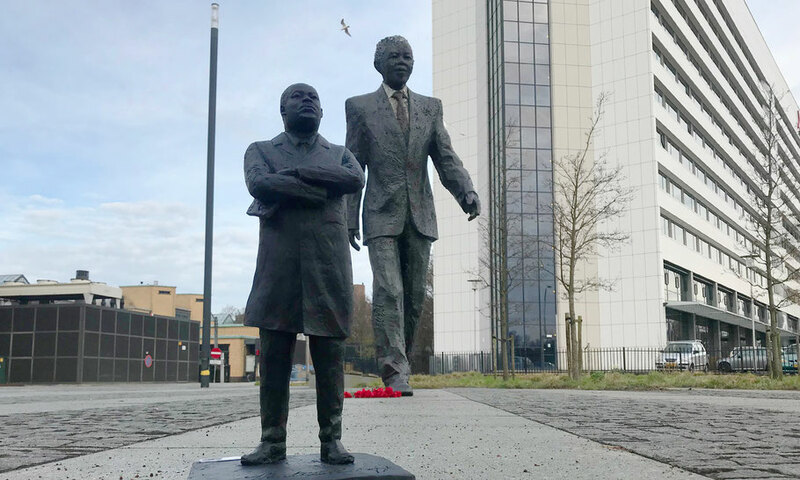 The Nelson Mandela statue, Long Walk to Freedom (title after Mandela's autobiography), is located at Johan de Wittlaan in The Hague, measures 11.5 ft (3.5 meter). The statue, made by painter and sculptor Arie Schippers, was unveiled by Archbishop Desmond Tutu in 2012.